The Rapide is Aston Martin’s first foray into four-door territory since the Lagonda of the 1970s. It’s an unqualified success. Arriving in the Scottish Borders for a driving day to test the British manufacturer’s latest supercar, I was confronted by the sight of five Rapides parked side by side inside the gates of Barony Castle, near Peebles. It’s a staggeringly beautiful car. Aston Martin have always made cars that are effortlessly elegant, but I had expected that as is the case with Porsche’s Panamera the marque’s designers would struggle with proportion when wrestling those extra doors in. Not so. The Rapide looks lovely from every angle. Long, low and sleek, at first glance it’s easy to miss those two rear doors, partly because there’s no visible B pillar so the glass in both doors appears to merge into one. Open the door and the glass drops a few millimetres, rising again when the door is shut. Once the car starts moving, the glass rises further still to reduce wind noise. The flipside to the Rapide’s stunning exterior is an interior that, while luxurious, is far from the last word in spaciousness. Four adults can travel in the Rapide but those in the rear will not be able to stretch their legs and will be aware of the roof lining hovering just above their heads. In contrast, Porsche’s Panamera is roomy enough for four six-footers to travel in all day, thanks to the head and legroom provided by its slightly bulbous rear quarters. On the plus side, the Rapide’s boot has a practical hatchback opening and offers 317 litres of space again, less than the Panamera, but still very decent. Fold the rear seats flat and there’s 886 litres of volume enough for a couple to go on an extended holiday. Underneath the bonnet is a 6.0 litre V12, channelling its 469bhp and 443lb/ft of torque through a six-speed automatic gearbox. Zero to 62mph is achieved in 5.3 seconds, and top speed is 188mph. 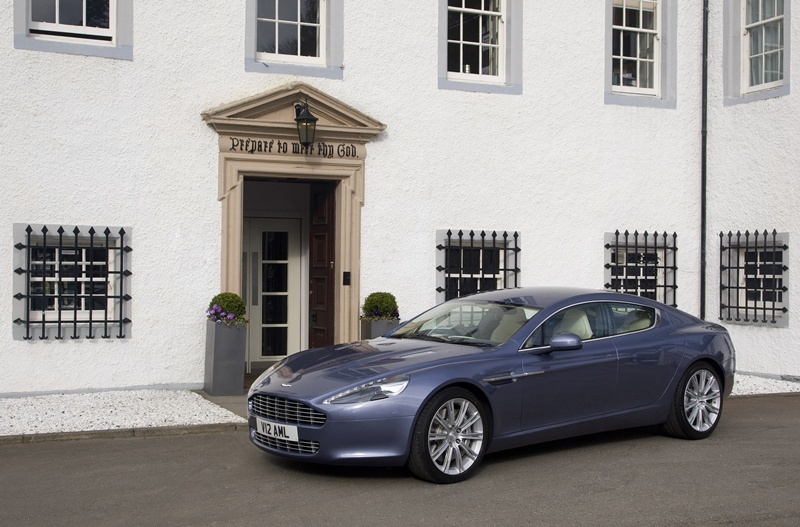 Drive the Rapide gently and it’s a remarkably good cruiser. There’s very little in the way of noise and the ride is cosseting for a sports car.SurgingAs soon as you squeeze the pedal, everything changes. The engine springs into life, waking up with a delighted yowl and sending the car surging towards the horizon. On unfamiliar country roads, I didn’t even try to push the envelope of the Rapide’s handling, though I did push it through a few of the more open corners at speed. With the car in normal suspension setting it remained utterly poised and flat. I wouldn’t recommend switching the suspension setting to sports it changes the ride from comfortable to bone shaking with little perceptible difference in handling ability. The Rapide weighs in at £139,950. For that, you get pretty much everything the only options are a rear entertainment system and cooled seats in addition to the standard heated ones. It’s still a lot more than the Panamera, which costs around £80,000. One of Aston’s press officers tried convincing me that if you brought a Panamera up to Rapide equipment levels, there would be very little difference in price. I don’t believe anyone’s going to spend £60,000 on extras, however, nor do I remember the £85,000 Panamera I had a few weeks ago being terribly under-equipped. No, you pay that much money because it’s an Aston Martin and because that makes it special. The Porsche Panamera is a great car, but the Aston is a greater one still. Price: Around £139,9500-62mph: 5.3 seconds.Top speed: 188mph. Economy: 19mpg. CO2 emissions: 355 g/km.